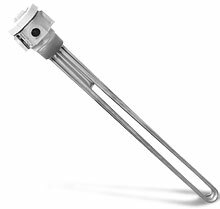 The OMEGALUX™ EMTS-3 Series Includes 3 heating elements all within the compact 2" NPT fitting. The electropolished stainless steel sheath design is well suited for mild corrosive solutions commonly found in industrial applications. kW Volts Phase W/in2 Dim.B. /*Insert the suffix “3P” to the catalog number for 3 phase power. 1 Heaters with General Purpose Enclosures are UL Listed and CSA Certified except models that exceed 48 amps.